This service is ideal for older machines and systems that are out of warranty with the OEM. We can reverse engineer, rebuild, and redesign machinery components or entire pieces of equipment for customers in various industries. We can custom fabricate repair parts; hence, provide a very attractive cost saving option to purchasing completely new equipment. Our experienced fabricators are able to create parts from a range of materials such as steel, stainless steel, and aluminum, as well as exotic metals. For example, while we can certainly machine a new spindle, it is important to know whether the spindle needs to be replaced because the part itself is worn out or if there is something within the machinery that is causing spindles to break. After the issue is carefully diagnosed, our team will develop a quote for the job that includes the costs and the time frame that will be required. We strive to offer our customers the best cost-saving solution. Our team will then communicate the problems and explain the solutions to our customers in a professional and caring manner. We strive to answer all customers' questions and concerns. Only after our customers understand the extent of repairs required and approve the provided quote, then the project begins. Removing rust, sludge build-up, and old coatings from machinery components as well as structural elements. Reusable parts are cleaned and worn parts are replaced. If replacement parts are not readily available, they can be machined in-house based on the prints or on the physical part. We can machine, punch, cut, heat treat, and powder coat parts using a combination of in-house capabilities and trusted vendors. Having a reliable network of partner vendors perform machining, grinding, blasting, and finishing services allows us to provide customers with turnkey manufacturing convenience, while allowing us to remain competitive as a sheet metal fabrication and equipment repair shop. Once the equipment is re-assembled, any functionality testing can be performed as needed to verify the operation of the machinery. 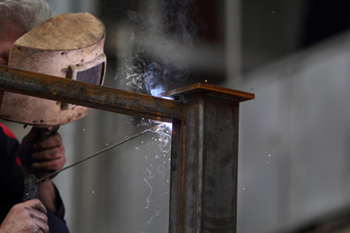 Our welders are AWS certified and we are able to comply with any applicable industry quality standards. For additional information about our part repair and equipment rebuilding capabilities, please contact us directly. Jupiter Design & Manufacturing © .